If you have a gym membership, there's no excuse not to whittle away excess belly fat, because all the tools you need are within your reach. Although a sensible, reduced-calorie diet can trigger weight loss, combining it with regular exercise gives you the weight-loss edge and makes it easier to keep the weight off long-term. Rather than solely focusing on your stomach in the gym, take on a whole-body approach, because the only way to reduce stomach flab is by reducing total body fat. Engage in at least 30 minutes of moderate cardio on three days of the week to raise your heart rate and burn calories. 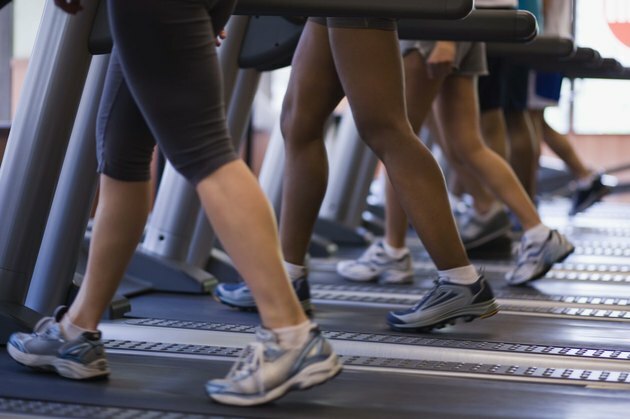 Jog or walk briskly on a treadmill, ride on a stationary bike, pedal on an elliptical machine, participate in an aerobics class, or use a stair climber or rowing machine. Try different forms of cardio to prevent boredom and to keep your body challenged. Perform high-intensity interval training on two days of the week. According to the National Institutes of Health, high-intensity intervals effectively reduce belly fat. 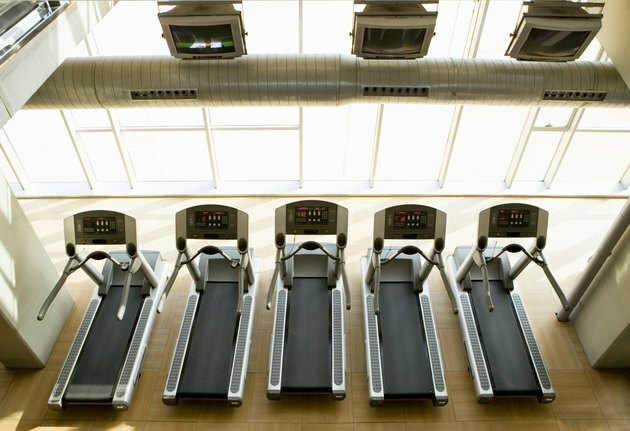 Jog at an easy-to-maintain pace on a treadmill for two minutes, and then speed up to a vigorous, one-minute sprint. Alternate between these intensities for about 20 minutes to complete your training session. 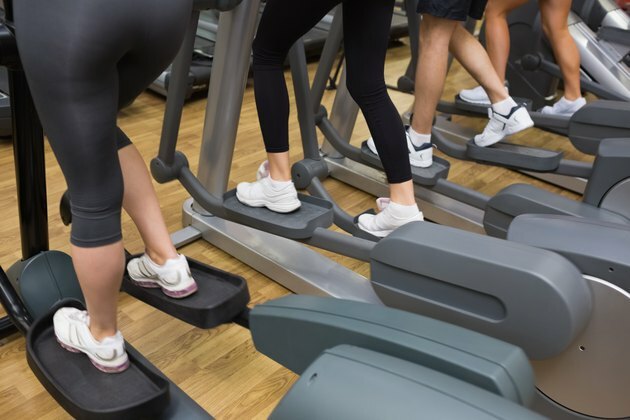 For variety, also try doing intervals on a stationary bike, stair climber or elliptical machine. Incorporate a 30-minute strength-training session into your workout routine on at least two days of the week. Strength training helps you maintain muscle tissue, which uses up more calories than fat to sustain itself. 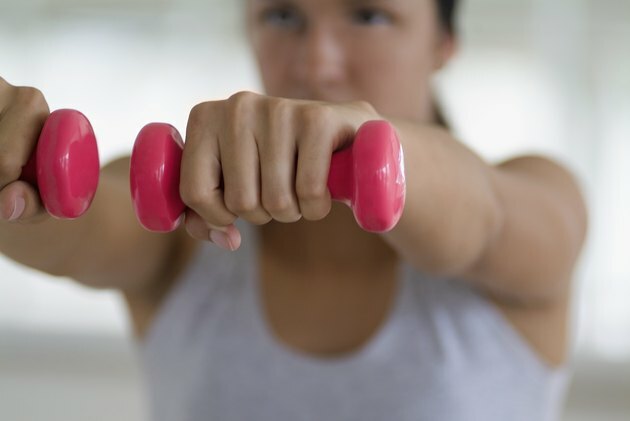 You burn calories during and up to two hours after strength training. Target all your major muscle groups with free weights, body weight exercises, weightlifting machines or resistance bands. Perform exercises, such as bench presses, overhead presses, lunges, squats, biceps curls and triceps dips. Perform abdominal-strengthening exercises for five minutes every day, as recommended by the American Council on Exercise. Include knee raises in a captain's chair apparatus in your routine. Place your back against the back rest and your forearms on the arm rests. Then grasp the handles, step your feet off the foot support and bend your knees as you slowly raise them toward your chest. Focus on the contraction in your abs and avoid moving your upper body. When your thighs are parallel to the floor, return your legs to the starting point in a controlled motion. Make bicycle crunches part of your ab workout. Lie face up on a mat with your fingertips behind your head and your elbows pointing out. Raise your legs about 45 degrees off the floor, and then crunch up and twist your torso to the left, bringing your right elbow and left knee toward each other. Then return to the starting point, repeat the motion on your other side and continue alternating sides. Perform crunches on a stability ball. Sit on a stability ball and walk your feet forward until the ball is in your mid-back and your torso is parallel to the floor. Place your feet hip-width apart on the floor, and adjust them as needed; wider feet make it easier to stay balanced on the ball. Place your fingertips behind your head, and then use your abs to slowly raise your torso about 45 degrees. Return to the starting point and repeat the crunching motion. 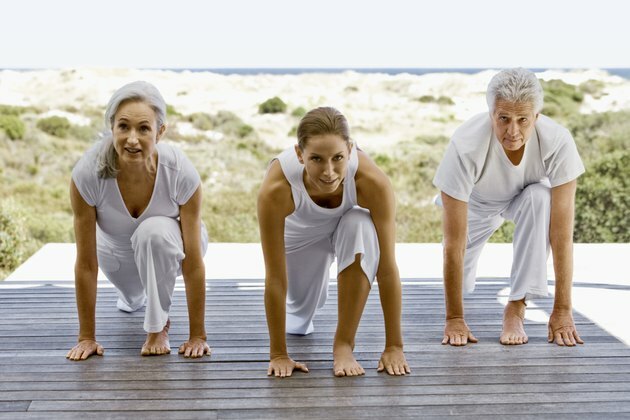 Participate in yoga classes to manage and reduce stress. According to Alyson Ross, Ph.D., a yoga research coordinator at the Casey Health Institute, yoga reduces cortisol levels in your body. Cortisol is a stress hormone that triggers hard-to-control cravings for diet-sabotaging foods and causes fat storage around your middle. If available at your gym, meditation and tai chi can also help reduce stress. Understand that abdominal-strengthening exercise won't reduce belly fat, but will strengthen your muscles underneath the fat. This can improve your posture, alleviate back pain, and result in a toned, tight tummy once the fat reduces. Take advantage of the certified trainers that are available at the gym. They can teach you proper exercise form and answer any questions you might have. See your doctor before beginning a new workout routine, particularly if you suffer from an injury or health condition, or have been inactive.